O n a Saturday morning at the Gleason Public Library in Carlisle last month, Jason Walsh deposited a tall stack of materials on the returns desk and automatically reached for his wallet. It was the end of school vacation, and he was sure that at least a few of the books, CDs, and DVDs his three young daughters had consumed over the past week had accrued some fines. In Carlisle, it was a decision that the library trustees began discussing with Gleason’s director, Angela Mollet, almost a year ago. When Mollet mapped out the financials, she discovered that as a revenue stream, overdue fines are actually as much a cost as a benefit. Last year, the Gleason Public Library collected $8,575 in fines, and a recent change in the library’s e-mail notification system, which notifies patrons before materials are due, is resulting in fewer late returns, so the yearly total is expected to be even smaller. Moreover, processing the monies collected from overdue books bears its own costs in terms of staff time, for collecting and reconciling accounts, and infrastructure such as change boxes and safes. “Every transaction, which was often only 10 or 20 cents, had a cost associated with it,’’ Mollet said. Moreover, although many patrons paying the fee shrugged it off, saying they were happy to support a good cause such as their local library, the money actually went into the town’s general coffers, with no guarantee that it would be channeled back to the library. The staff and trustees at the Gleason Public Library are also eager to eliminate any obstacles to reading, especially for children. “We want to encourage people to continue using books,’’ Mollet said. “I don’t like the idea of charging people for reading. It can make coming to the library a negative experience. Kids in particular may stay away from the library because they are intimidated by the thought of owing fines, or embarrassed to be told they need to pay. Besides, there was also a little bit of institutional peer pressure. Gleason is part of the Merrimack Valley Library Consortium, over half of whose 35 members do not apply fines, including two of Carlisle’s neighboring towns, Chelmsford and Westford. While the libraries do not consider one another to be competitors, Mollet said, it pained her to know that Carlisle residents were using those neighboring libraries instead of the one in their own town to avoid paying fines. Not every community is in agreement, though. 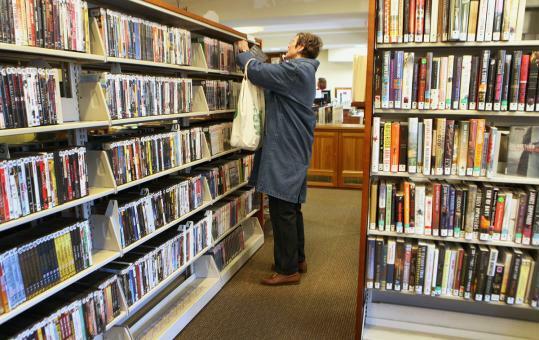 The Minuteman Library Network, which includes 61 libraries in 42 area communities, still charges fines almost uniformly; the fees typically range from 10 to 25 cents per day for books or CDs, and are $1 per day for DVDs. And some library directors stand firmly behind this policy. Mollet concedes that the responsibility argument makes some sense, especially where children are concerned. Patrons still receive reminders when their items are overdue, and after a certain number of weeks, the item is considered missing and the patron is charged a replacement cost, a policy typical among libraries throughout the state whether or not they charge late fees. For patrons of the fine-free system, though, it feels like a win-win situation. Another Carlisle mother, Amy Livens, is a little bit more equivocal. Some libraries that do not charge fines put out a container (sometimes labeled a “guilt box’’) where patrons can donate whatever amount they wish as they return items, but that doesn’t alleviate the administrative tasks associated with collecting money, Mollet pointed out. She also considers the change to be an acknowledgment of the evolving role of libraries in the context of ever-expanding technology. Even a small library like hers, in a town of less than 6,000, deals in e-readers, e-books, and virtual catalog materials, for which the appropriate model may be more along the lines of a Netflix or an Amazon than an old-fashioned lending library. Ultimately, though, Mollet and Gleason’s trustees believe that being fine-free is a policy in keeping with their mission as an institution. And for those who simply can’t overcome the desire to be punished for keeping late materials, she hastened to point out, there are the general endowment, the Friends of the Library, and memorial funds, all of which welcome donations at any time. Those contributions, unlike overdue fines, go straight to the library for programming and other improvements.